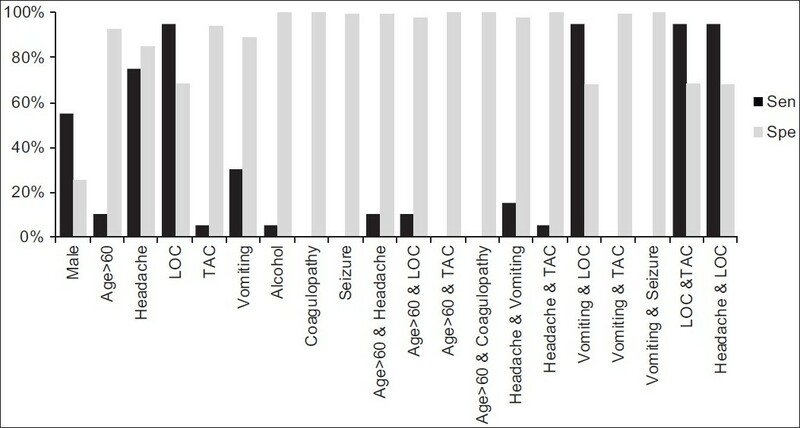 Symptoms such as headache,  vomiting,  loss of consciousness (LOC) or amnesia,  and post-traumatic seizure  signs such as physical evidence of trauma above the clavicles,  skull fracture or contusion ,, and raccoon sign,  past history such as alcohol intoxication  or coagulopathy,  and age more than 60 years  have been discussed as the risk indicators for abnormalities in brain CT scan of patients with MHI. Thus, several studies have been performed to determine variables for brain CT indication. ,,,,,0, However, no general consensus has been achieved in the indications for brain CT scan. This study was conducted to survey the post-traumatic symptoms, signs or other important past historical matters of patients as a risk indicator that can be used for the indication of brain CT scan in the MHI. In this prospective study, all patients with blunt traumatic head injury who were more than 2 years old, had a GCS score ≥13 and were referred to the EDs of Rasoul-Akram and Shohadaye-Haftome-Tir hospitals (two referral trauma centers in Tehran) in 2008, underwent non-contrast brain CT scan. They were scanned on similar CT scanners with the same techniques at both hospitals. The patients were primarily visited by residents of Emergency Medicine. Data on age, headache, vomiting, LOC or amnesia, post traumatic seizure, physical evidence of trauma above the clavicles, alcohol intoxication and current anticoagulant usage were collected. The risk indicators were defined based on Haydel's study:  Headache was defined as any new head pain, whether diffused or local. Vomiting was defined as any emesis after a traumatic occurrence. A deficit in short-term memory was defined as persistent anterograde amnesia in a patient with an otherwise normal score on the GCS. The reliability of obtaining a history of loss of consciousness and post-traumatic amnesia is a difficult and well-known problem in clinical practice, and therefore both of them were our practical definition. Seizure was defined as a suspected or witnessed seizure after the traumatic event. The physical evidence of trauma above the clavicles was defined as any external evidence of injury, including contusions, abrasions, lacerations, deformities, and signs of facial or skull fracture. Alcohol intoxication was determined on the basis of the history obtained from the patient or a witness and suggestive findings such as slurred speech or the odor of alcohol on the breath on physical examination. Coagulopathy was defined as a history of bleeding or a clotting disorder or current treatment with warfarin or other types of anticoagulation. Instability, additional troubles that required specialized care, opium-addiction, probability of malingering, and refusing to take part in the study; factors which excluded the patients from the study. All questionnaires and clinical assessments were completed before the brain CT studies; therefore, the evaluating clinician was blind to the result of scanning. Brain CT scans were reviewed by the attending physician at the ED who had 5 years of experience. The main outcome measured was the presence of lesions related to the trauma in brain CT scan, which includes depressed fracture, base skull fracture, epidural hematoma, subdural hematoma, subarachnoid hemorrhage, pneumocephalus, and contusion. The hospitalized patients were visited daily by residents of Emergency Medicine and the other patients were followed-up after one week using telephone interviews to assess for symptoms of increased intracranial pressure. The frequency of positive CT scans was determined for each risk indicator. The sensitivity, specificity, and positive and negative predictive values of significant indicators were calculated for those risk indicators, which had an association with abnormal brain CT scan related to the trauma. For categorical variables, Chi-square test was used. Predictive analytics software (PASW) version18 was utilized for analyzing the data. Logistic regression analysis was performed using STATA 8, (Special Edition, Texas, USA) to detect the risk indicators associated with positive findings in the brain CT scan controlling the effect of other risk indicators. The study was reviewed and confirmed by the Ethics Committee of the Iran University of Medical Sciences. Six hundred and forty-two patients were examined by brain CT scan after a blunt head trauma. The mean age of the patients was 29.9±16.7 years (range: 3 to 90), and 74.5% were male. 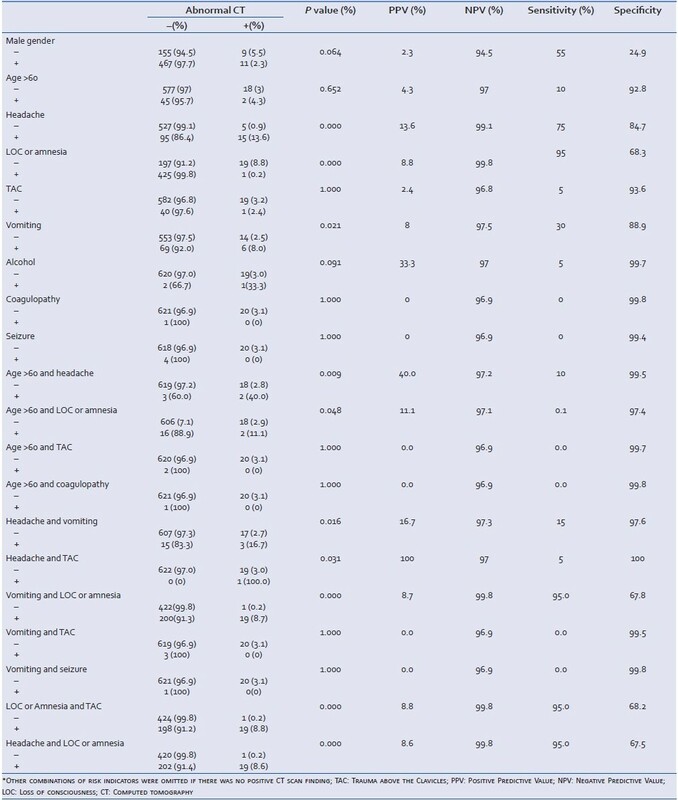 Three hundred eighty-eight patients (60.4%) did not have any risk indicator [Table 1]. The number of risk indicators was associated with a higher rate of abnormal finding related to the trauma in CT scans [Table 1]. Twenty patients (3.1%) had abnormal brain CT scans. Among the patients with abnormal brain CT related to the trauma, one had no risk indicators, all of the remaining had LOC or amnesia; thirteen patients had two risk indicators, and six people had three indicators at the same time. Patients with headache, LOC or amnesia, and vomiting had a higher rate of abnormal CT scans [Table 2]. A schematic illustration of the sensitivity and specificity of different symptoms and signs in mild head injury was shown in [Figure 1]. Finally, the regression analyses were applied to determine the effects of variables associated with abnormal brain CT scan related to the trauma. The logistic regression model showed that headache (P=0.006), LOC or amnesia (P=0.024), and alcohol (P=0.036) were associated with abnormal brain CT related to the trauma [Table 3]. This study demonstrated that headache, vomiting, LOC or amnesia, and alcohol intoxication were four risk indicators suggested for the indication of brain CT scan in MHI. Based on some researches, LOC or amnesia could be used as a guide to predict the probability of abnormal CT scan following MHI. ,, Murshid et al. and Gomez et al. found the converse result. Both Miller and Hydel's criteria were developed for patients with GCS 15, while our study included patients with GCS 13-15. Stiell et al. have developed the Canadian CT head rule consisting of 5 high-risk criteria including age >65 years, suspected open or depressed skull fracture, vomiting more than two episodes, sign of basal skull fracture and GCS score <15 at 2 hours after trauma that suggest the risk of neurological intervention and 2 medium-risk criteria including amnesia before impact >30 minutes and dangerous mechanism of injury that suggest the risk of significant brain injury on brain CT scan. Using these criteria, 46% of the patients would not need to undergo CT scanning. In this rule, patients without LOC, amnesia or disorientation were not evaluated in the study, but we included all patients with a history of blunt head trauma. We suggested that abnormal brain CT scan related to the trauma after MHI can be predicted by the presence of one or more of the following risk indicators: Headache, vomiting, LOC or amnesia and alcohol intoxication. Thus, if any patient has these indicators following MHI, he must be considered a high-risk MHI. The authors thank Mrs. Bita Pourmand for her edit of the manuscript. 1. Cassidy JD, Carroll LJ, Peloso PM, Borg J, von HH, Holm L, et al. Incidence, risk factors and prevention of mild traumatic brain injury: Results of the WHO Collaborating Centre Task Force on Mild Traumatic Brain Injury. J Rehabil Med 2004;(43 Suppl):28-60. 2. Mack LR, Chan SB, Silva JC, Hogan TM. The use of head computed tomography in elderly patients sustaining minor head trauma. J Emerg Med 2003;24:157-62. 3. Stein SC, Ross SE. Minor head injury: A proposed strategy for emergency management. Ann Emerg Med 1993;22:1193-6. 4. Smits M, Dippel DW, de Haan GG, Dekker HM, Vos PE, Kool DR, et al. Minor head injury: Guidelines for the use of CT - A multicenter validation study. Radiology 2007;245:831-8. 5. Miller EC, Holmes JF, Derlet RW. Utilizing clinical factors to reduce head CT scan ordering for minor head trauma patients. J Emerg Med 1997;15:453-7. 6. Haydel MJ, Preston CA, Mills TJ, Luber S, Blaudeau E, DeBlieux PM. Indications for computed tomography in patients with minor head injury. N Engl J Med 2000;343:100-5. 8. Abdul Latip LS, Ahmad Alias NA, Ariff AR, Shuaib IL, Abdullah J, Naing NN. CT scan in minor head injury: A guide for rural doctors. J Clin Neurosci 2004;11:835-9. 9. Ono K, Wada K, Takahara T, Shirotani T. Indications for computed tomography in patients with mild head injury. Neurol Med Chir (Tokyo) 2007;47:291-7. 10. Shackford SR, Wald SL, Ross SE, Cogbill TH, Hoyt DB, Morris JA, et al. The clinical utility of computed tomographic scanning and neurologic examination in the management of patients with minor head injuries. J Trauma 1992;33:385-94. 11. Miller EC, Derlet RW, Kinser D. Minor head trauma: Is computed tomography always necessary? Ann Emerg Med 1996;27:290-4. 12. Reinus WR, Wippold FJ 2 nd , Erickson KK. Practical selection criteria for noncontrast cranial computed tomography in patients with head trauma. Ann Emerg Med 1993;22:1148-55. 13. Smits M, Dippel DW, Steyerberg EW, de Haan GG, Dekker HM, Vos PE, et al. Predicting intracranial traumatic findings on computed tomography in patients with minor head injury: The CHIP prediction rule. Ann Intern Med 2007;146:397-405. 14. Saadat S, Ghodsi SM, Naieni KH, Firouznia K, Hosseini M, Kadkhodaie HR, et al. Prediction of intracranial computed tomography findings in patients with minor head injury by using logistic regression. J Neurosurg 2009;111:688-94. 15. Stein SC, Young GS, Talucci RC, Greenbaum BH, Ross SE. Delayed brain injury after head trauma: Significance of coagulopathy. Neurosurgery 1992;30:160-5. 16. Haydel MJ. Clinical decision instruments for CT scanning in minor head injury. JAMA 2005;294:1551-3. 17. Stein SC, Burnett MG, Glick HA. Indications for CT scanning in mild traumatic brain injury: A cost-effectiveness study. J Trauma 2006;61:558-66. 18. Smits M, Dippel DW, de Haan GG, Dekker HM, Vos PE, Kool DR, et al. External validation of the Canadian CT Head Rule and the New Orleans Criteria for CT scanning in patients with minor head injury. JAMA 2005;294:1519-25. 19. Eng J, Chanmugam A. Examining the role of cranial CT in the evaluation of patients with minor head injury: A systematic review. Neuroimaging Clin N Am 2003;13:273-82. 20. Smits M, Dippel DW, Nederkoorn PJ, Dekker HM, Vos PE, Kool DR, et al. Minor head injury: CT-based strategies for management-a cost-effectiveness analysis. Radiology 2010;254:532-40. 21. Saboori M, Ahmadi J, Farajzadegan Z. Indications for brain CT scan in patients with minor head injury. Clin Neurol Neurosurg 2007;109:399-405. 22. Shiomi N, Echigo T. A guide to initial management of minor head injury. No Shinkei Geka 2004;32:465-70. 23. Viola L, Zotta D, Martino V, Barbato R, Schisano G. Minor head injuries: One year experience according to the new Italian guideline. Acta Neurochir (Wien) 2000;142:1281-5. 24. Stiell IG, Laupacis A, Wells GA; Canadian CT Head and Cervical-Spine Study Group. Indications for computed tomography after minor head injury. N Engl J Med 2000;343:1570-1. 25. Murshid WR. Management of minor head injuries: Admission criteria, radiological evaluation and treatment of complications. Acta Neurochir (Wien) 1998;140:56-64. 26. Gomez PA, Lobato RD, Ortega JM, De La CJ. Mild head injury: Differences in prognosis among patients with a glasgow coma scale score of 13 to 15 and analysis of factors associated with abnormal CT findings. Br J Neurosurg 1996;10:453-60. 27. Stein SC, Spettell C, Young G, Ross SE. Limitations of neurological assessment in mild head injury. Brain Inj 1993;7:425-30. 28. Smits M, Dippel DW, de Haan GG, Dekker HM, Vos PE, Kool DR, et al. External validation of the Canadian CT Head Rule and the New Orleans Criteria for CT scanning in patients with minor head injury. JAMA 2005;294:1519-25. Zare, M.A. and Ahmadi, K. and Zadegan, S.A. and Farsi, D. and Rahimi-Movaghar, V.